View of the interior of the cathedral. Skálholt (Old Icelandic: Skálaholt) is a historical site in the south of Iceland, at the river Hvítá. Skálholt was, through eight centuries, one of the most important places in Iceland. From 1056 until 1785, it was one of Iceland's two episcopal sees, along with Hólar, making it a cultural and political center. Iceland's first official school, Skálholtsskóli (now Reykjavík Gymnasium, MR), was founded at Skálholt in 1056 to educate clergy. In 1992 the seminary in Skálholt was re-instituted under the old name and now serves as the education and information center of the Church of Iceland. Throughout the Middle Ages there was significant activity in Skálholt; alongside the bishop's office, the cathedral, and the school, there was extensive farming, a smithy, and, while Catholicism lasted, a monastery. Along with dormitories and quarters for teachers and servants, the town made up a sizable gathering of structures. 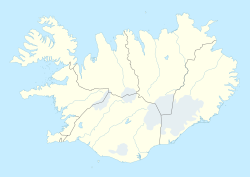 Adam of Bremen, writing circa 1075, described Skálholt (Scaldholz) as the "largest city" in Iceland. First the diocese of Skálholt was a suffragan of the Archdiocese of Hamburg-Bremen. When in 1104 the Diocese of Lund was elevated to an archdiocese, Lund became the metropolitan of Skálholt, and in 1153 Skálholt became a part of the province of Nidaros. Continuing as the episcopal see after the Reformation to Lutheranism, the end of Catholicism in Iceland was marked in 1550 when the last Catholic bishop, Jón Arason of Hólar, was executed in Skálholt along with his two sons. Although no longer episcopal sees, Skálholt and Hólar are still the cathedra of the Church of Iceland's two suffragan bishops, and therefore the old cathedrals still serve as such. Skálholt also receives many visitors each year. Hospitality is a branch of Skálholtsskóli's work and visitors can stay in its dormitories, single rooms, and cottages. Many cultural events such as concerts are held in Skálholt. Foremost of these is the Summer Concerts program in July, in which prominent classical musicians, choirs and other musicians are invited to perform. In the late 16th century Sigurður Stefánsson, a young teacher from Skálholt and grandson of a Skálholt bishop, used the available documentary evidence to mark the sites of the ancient Norse discoveries in the western Atlantic, including Vinland, on a map. After studying at the University of Copenhagen, Sigurður became a teacher at the former monastery of Skálholt, which remained the religious and educational centre in Iceland even after Protestantism was introduced in 1551. The 1570 original of Sigurður's Map no longer survives, but a copy was made in 1690 by Þórður Þorláksson [is] (also known by his Latinized name, Thorlacius), the Bishop of Skálholt, and is now in the collection of the Danish Royal Library. Numerous other copies were made by Scandinavian scholars. By matching latitudes with the British Isles, the map shows the northern tip of "Vinland" as being at about 51 degrees north, the same latitude as the southern tip of Ireland and Bristol, England. When this information was transferred to more modern maps, it indicated, among other things, that Sigurður had marked the promontory of Vinland at the same position as the northern promontory of Newfoundland, which was one of the factors that encouraged successful archaeological investigations by Helge Ingstad and his wife in 1960 at L'Anse aux Meadows, which is located at 51°35′47″N 55°32′00″W﻿ / ﻿51.59639°N 55.53333°W﻿ / 51.59639; -55.53333. ^ Fitzhugh, William W.; Ward, Elisabeth I., eds. (2000). Vikings: The North Atlantic Saga. Washington, D.C.: Smithsonian Books. pp. 20–21. ISBN 1-56098-995-5. 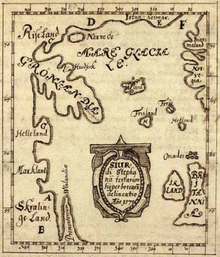 ^ "Biørn Jonsen of Skarsaa: Description of Greenland and the Skálholt Map - 10 verso". www.kb.dk. Retrieved 2018-07-27. Wikimedia Commons has media related to Skálholt.